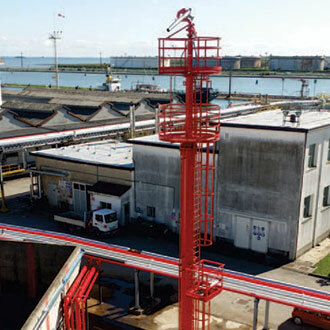 Monitor Towers are structural equipment used to increase the coverage area of ﬁreﬁghting monitors to approach a ﬁre from a certain height above ground for example marine terminals, loading bays or storage tank farms where it is necessary to pass over high obstacles to reach the ﬁre source. The challenge starts here since; the construction should stand by itself, be resistance to wind and seismic activities, handle reaction forces caused by the monitor and externally house all platforms, access ladders, conduit pipes etc. 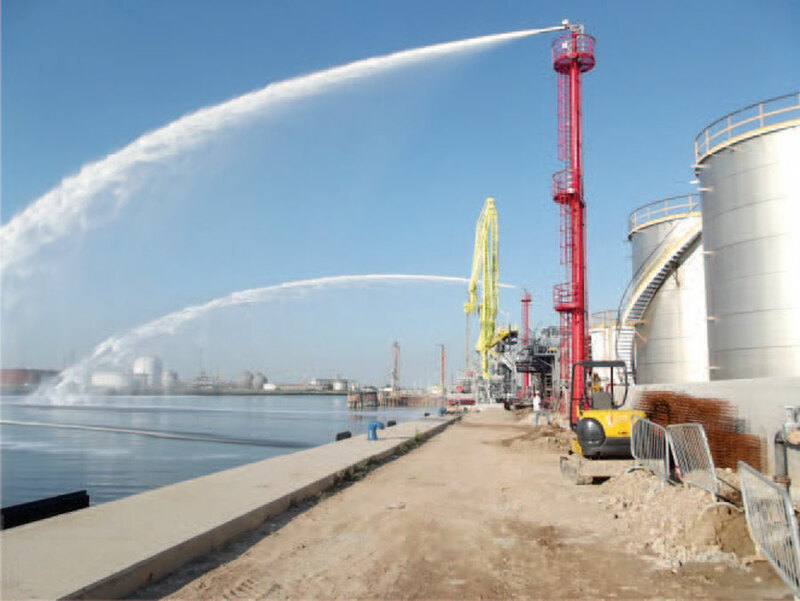 externally and should carry ﬁreﬁghting water/solution up to the extremity of the construction where the ﬁreﬁghting monitor is installed. Monitor towers, are usually constructed from Structural carbon steel materials. Material characteristics as shape, grade and thickness are selected according to calculations produced by a special FMEA software. Standard monitors are designed according to Euro Code standard series EN 1990, 1991, and 1993 etc. Steel constructions are classiﬁed according to several aspects such as consequence class, service category and materials used. 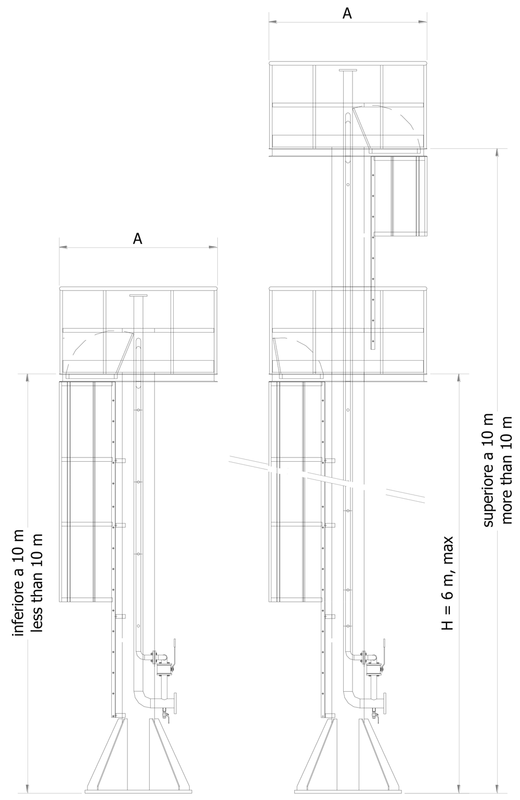 Monitor towers are subject to strict design and construction regulations according to the new European regulations, designed and produced in conformity with EN 1090-1 and EN 1090-1 with a CE mark and notiﬁed body's number. C.S.I. S.r.l. has obtained EN 1090 certiﬁcation from a recognized third party organization and has the capability to construct ﬁreﬁghting towers with CE marking according to EN 1090. Monitors towers simply consisting of a base ﬂange and a tubular structure connected to the base ﬂange, which carries the complete structure. The entre construction is made out of structural steels. C.S.I. S.r.l. uses internal water/solution carriage pipes, which run together with the structural main pipe. 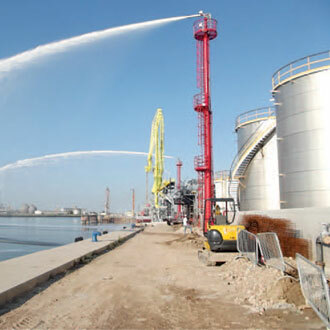 At the lower levels a connection pipe introduces the water/solution into the system and the connection ﬂange at the extremity of the tower, creates a connection point for ﬁreﬁghting monitors. 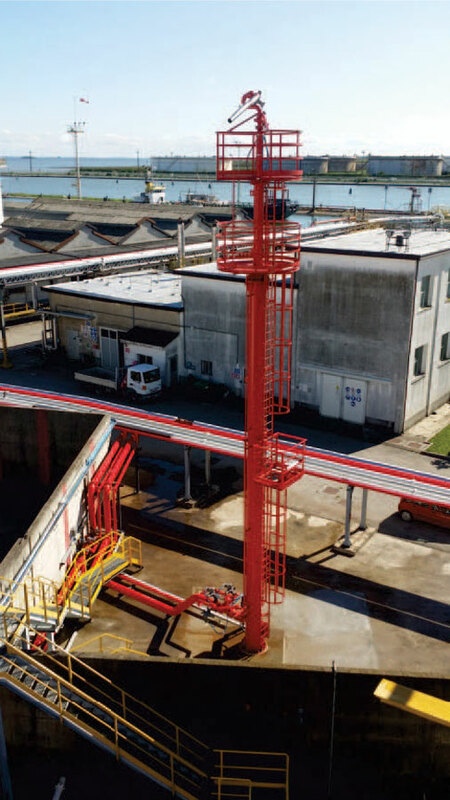 Working or resting platforms are designed according to ISO EN 14122-2 and ﬁxed marine type access ladders between the platforms and the ground level are designed according to ISO EN 14122-4 provided as access means to the monitor systems. All intermediate or upper platforms are always conﬁned with anti-fall protection and handrails. 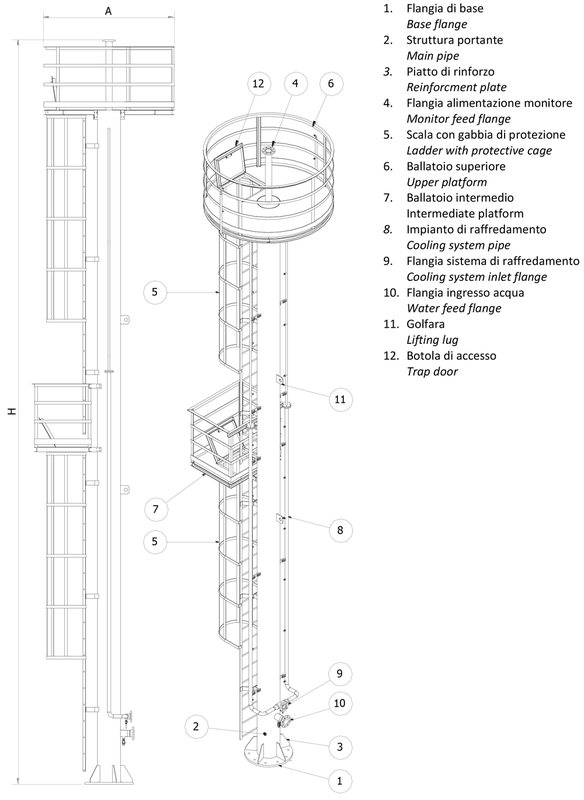 The Upper platform of tower deﬁnes the type of the tower as a ﬁxed platform or rotating platform towers. 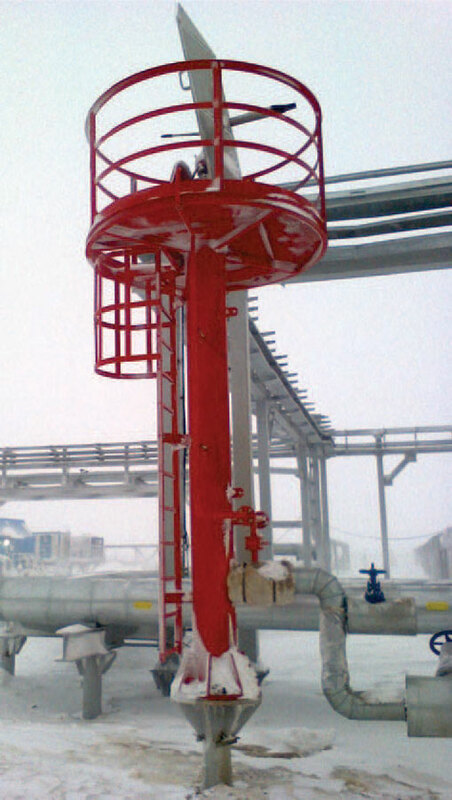 Fixed platform towers are attached permanent to the structure and Rotating platforms are equipped with a rolling mechanism, which takes movement from the monitor's horizontal movement motor and orientates itself according to the monitor's branch pipe direction. 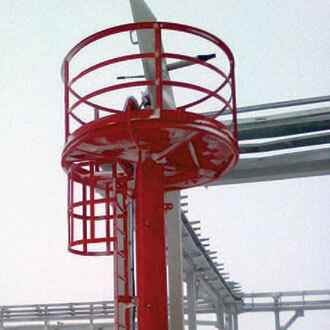 Rotating platforms are generally chosen where monitors should be aimed to minus depression angles to ﬁght ﬁre in the proximity of the towers base. On request, a spray cooling system runs together with the structure provided to protect it from exposure. Cooling systems may be fed from a separate ﬁreﬁghting water source or from the same main line, which feeds the monitor. Fire prooﬁng with cementitous coating cycles are available on request. On request hot dip galvanization may be oﬀered to our clients to protect equipment from corrosion. C.S.I. S.r.l. uses an earthing plate at the tower base for static electric transfer to earth. If requested, a Junction box at the base of the tower and conduit piping which protects the cables physically and also cabling according to ATEX or Non-hazardous area requirements with suitable cables, cable glands etc.